................are, in effect, Rotary for young people aged 12-18, working together to help others in the local community, and across the world, meeting challenges and having fun at same time. 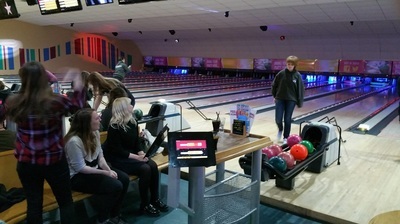 Clubs function under the sponsorship and guidance of a Rotary Club. 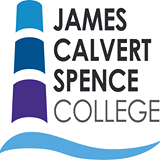 NEW GENERATION OF STUDENTS AT J.C.S. 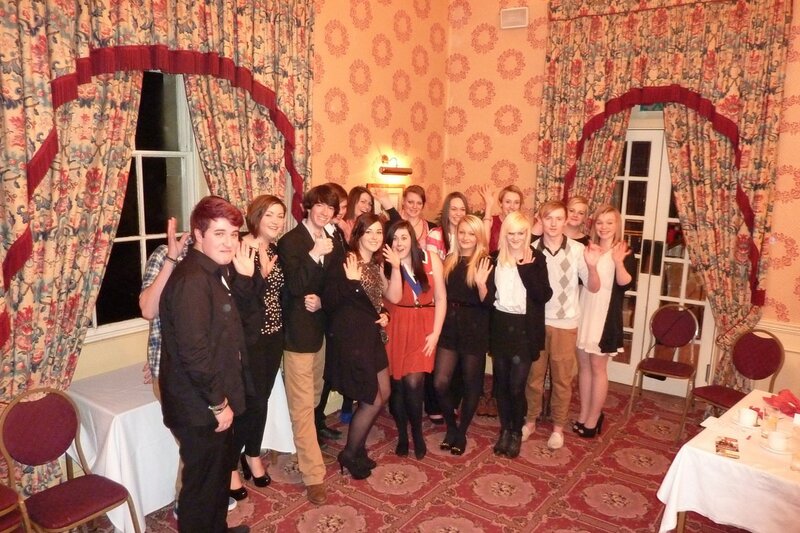 COLLEGE, AMBLE, CONTINUE THE INTERACT GROUP. JCS College students are continuing the Interact group, under the guidance of Rotary Amble and Warkworth. They meet every fortnight. New Club Officers are elected each year and students of mixed ages attended the meetings and identify community and international projects as a focus for their activities for each year. They organise social events and fun activities. Through their involvement they increase knowledge and understanding of community affairs and enhance their ability to work as a team. Interact representatives attend Rotary President's Night and other Rotary meetings throughout the year. Many help with the sleigh during the Christmas collections. 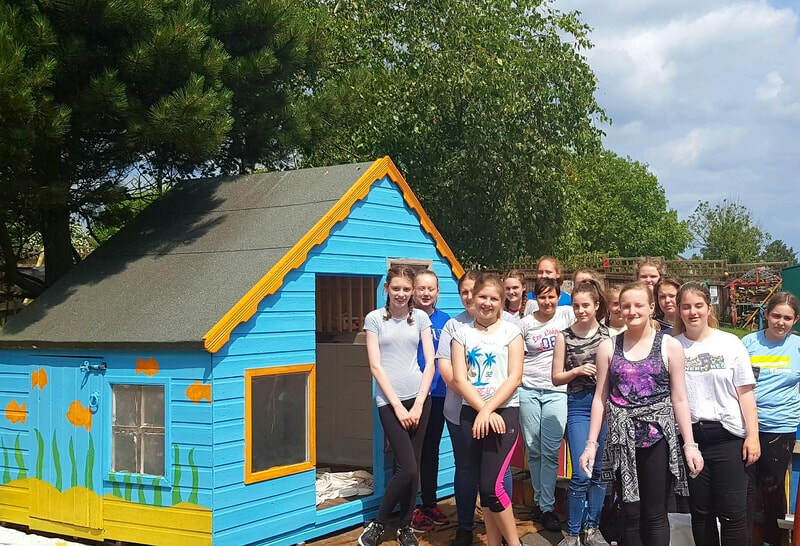 Interact members carry out a "Plastic Pick" on Amble beaches, and then Design and paint the Wendy House at Brambles Day Nursery. Then they cleaned the outdoor furniture! Students of James Colvert Spence College fill Rotary Shoeboxes with simple gifts for children and elderly persons in Eastern Europe. For the recipients these will probably represent their very first presents of any kind. 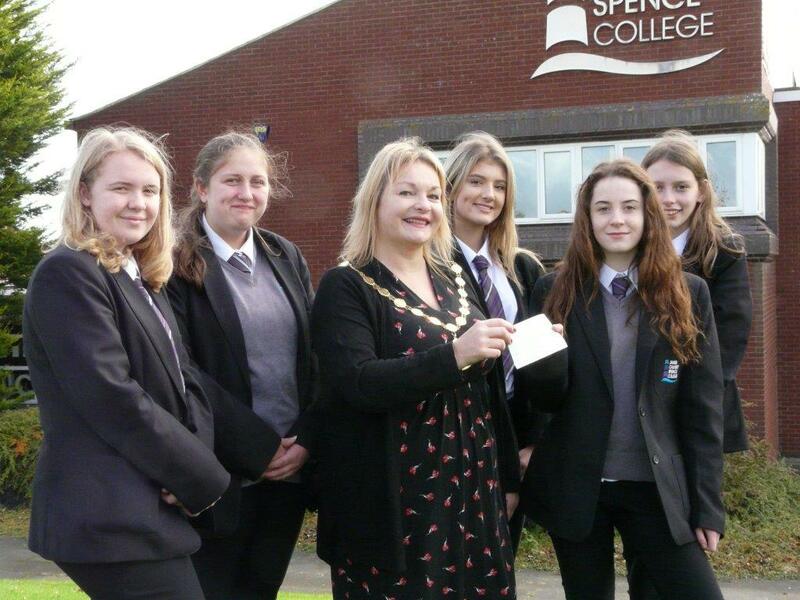 The Mayor of Amble, Jane Dargue, accepts a contribution to the Amble War Memorial Fund, from Interact students Emma Turner, Lily Parks, Erin Dodds, Niamh Sheils and Emily Grimsy at the James Calvert Spence College this morning. 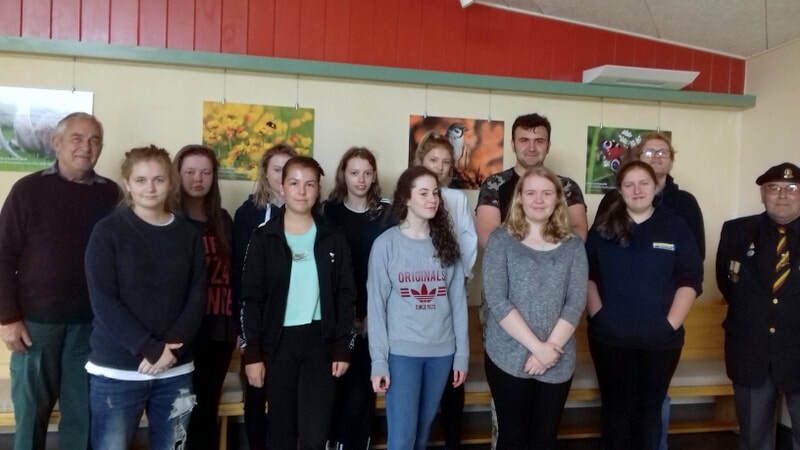 The funds were part of the proceeds of the student's sponsored walk at Hauxley Nature Reserve. Other deserving causes will be benefitting from their efforts at a later date. 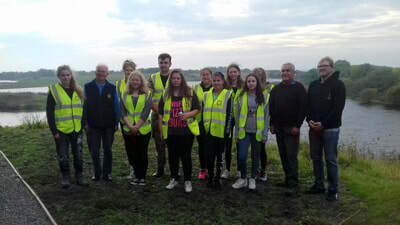 Interact Members gather for a sponsored walk around Hauxley Nature Reserve, with support from Rotarians, school staff and members of the Amble Town Council. The younger ones are the students! 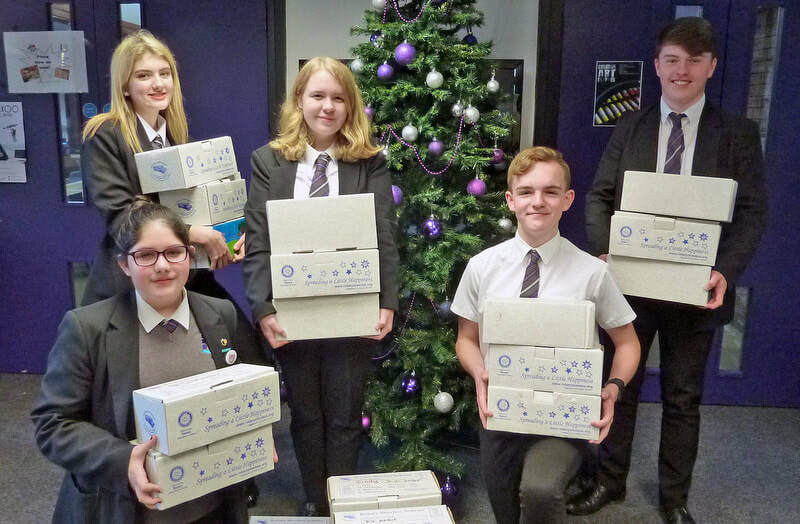 Our Interact Club, at The James Calvert Spence College in Amble, helped Rotary Amble & Warkworth with their annual Christmas Collection last December. Their share of the collection amounted to£300.They decided to donate this to Hippotherapy Northumberland which is based at Town Foot Farm, Shilbottle. Members of the Interact Club are pictured presenting the cheque to Angela Torsch, Paediatric Physiotherapist and Certified Hippotherapist. 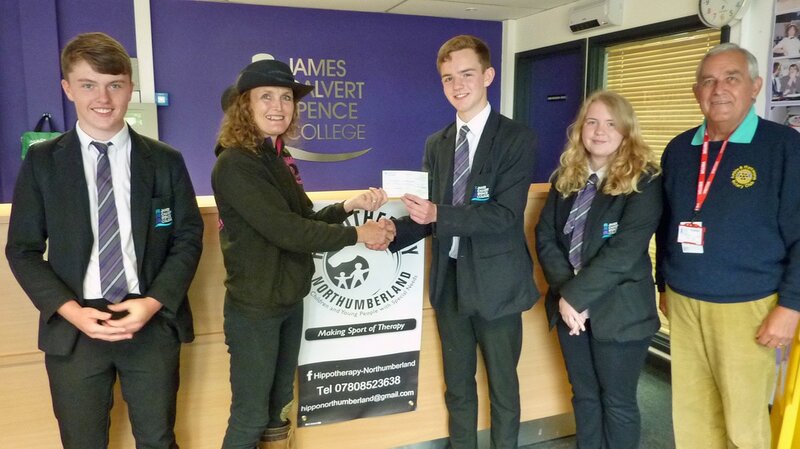 Members of the JCS.College Interact group are seen presenting funds to Peter, the District Shelterbox co-ordinator, for the purchase of a Shelterbox. The big green box contains everything needed for a family to stay alive in the event of their losing everything in a disaster situation - and some toys for the children. We cannot solve all the world's problems, but at least we know that one family will have shelter and security. 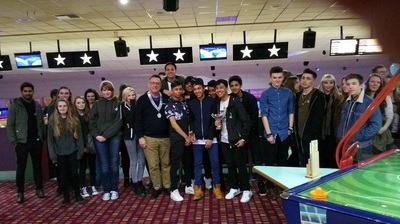 Well done to our Interact group, a fantastic effort. 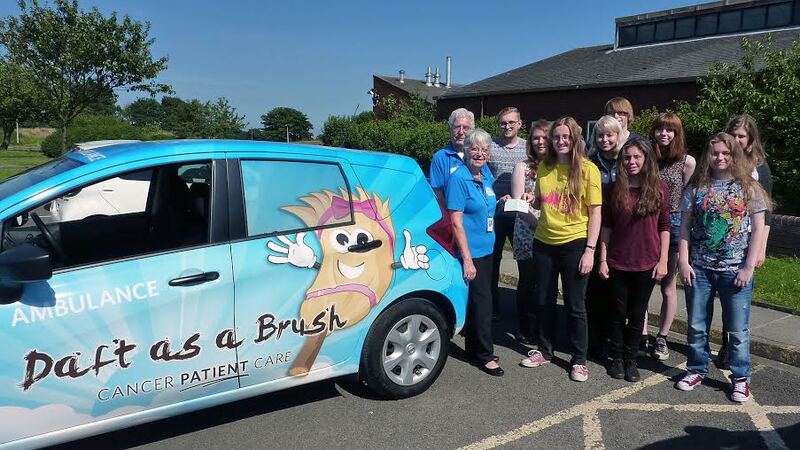 The Interact Club of Coquet and Aln presented a cheque to June Lee from the charity Daft as a Brush. The cheque was presented by the Interact Club President 17-years old Kathryn Wilkinson at the James Calvert Spence College, Amble. The Interact Club is sponsored by the Rotary Club of Amble and Warkworth. Elpha Lodge residents Trudy Anderson and Betty Franciosey are pictured receiving a cheque for £280 from Abby Sheldon, Vice President of the JCS.College based INTERACT Club. The money was raised from the sponsored swim where the Interactors swam the equivalent of 12 miles. They have already donated £300 to the Kandy Project through their "Wear a Christmas Jumper to School" event where everyone who took part paid £1 to wear their jumpers. JCSCOLLEGE INTERACTORS RAISE MONEY TO HELP PROVIDE ARTIFICIAL LIMBS FOR CHILDREN IN KANDY! The Interact Club presented a generous donation to District Governor Terry's Kandy Project. It was a pleasure to accompany them to an Alnwick meeting and share a presentation about The Centre for Handicapped with them. The District Youth Chair, Elaine, accepted the cheque after giving a presentation on the project to the Alnwick club members and the visitors from Amble & Warkworth, including President Dave Shoemaker and two representatives from the Interact Club, Natasha Carr and Toby Parks. 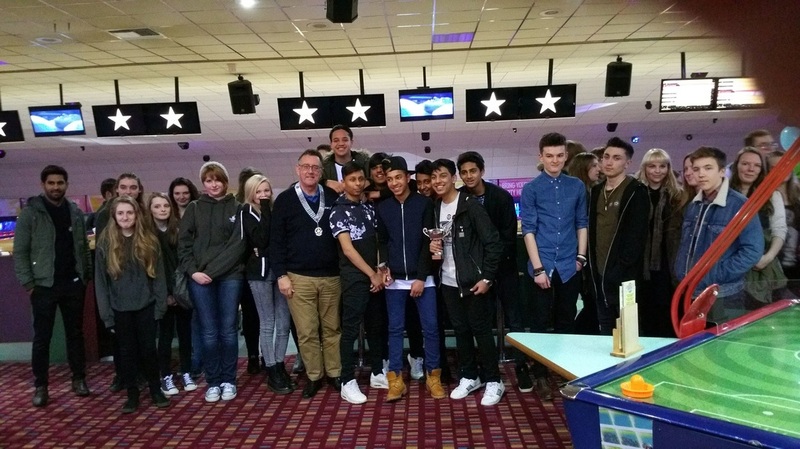 2016 INTERACT 10-PIN BOWLING COMPETITION. 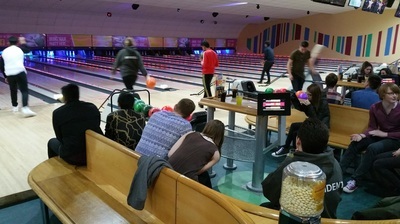 We have several Interact Clubs in our Rotary District and last night was their Annual 10-Pin Bowling Competition, at The AMF Bowl in Washington. Over 30 Interacters, including 13 from JCSCollege, took part and the winners were from The Sunderland Interact Club Sponsored by Seaburn Rotary Club. JCSCollege Interacters were an honourable?th. Next year??? 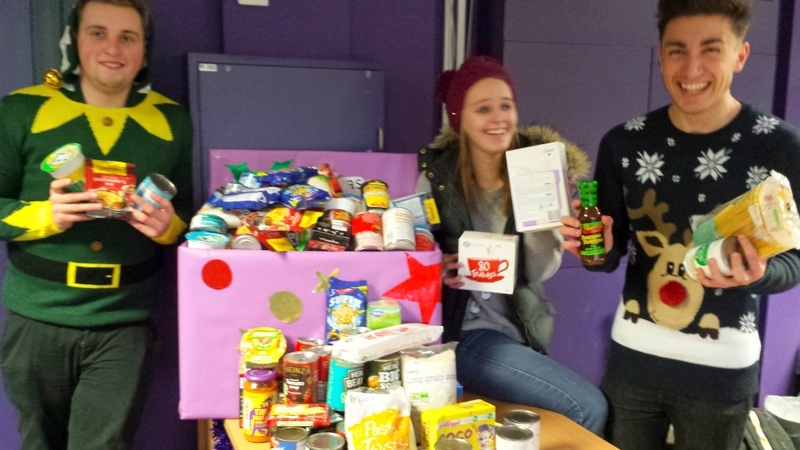 JCSCollege students paid for the priviledge of wearing Christmas jumpers. The net result was £279 raised for Elpha Lodge. The Seretary and Treasurer, Natasha Carr and Toby Parks pictured receiving their INTERACT insignia from President Dave Shoemaker. 2014/15 Interactors are seen here presenting a cheque to the charity SHAK. raise funds for their chosen charity.